An experience interview is a type of employment interview that’s designed to determine whether you have the right experience for the job for which you are interviewing. 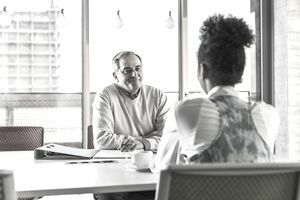 In an experience interview, the interviewee answers questions about his or her actions in a past employment situation. The interviewee demonstrates his or her skills and abilities by describing past achievements or experiences. Most job interviews will have at least some experience interview questions. They can be simple or fairly complex. These questions allow the hiring manager to assess whether or not a candidate for employment possesses the skills to handle situations and problems that will arise at the company and in the job for which the interviewee is being considered. Experience interview questions vary widely depending on the level of job you’re interviewing for. Some of these questions will relate directly to your resume and the experience you have listed, while others may be very general. You say in your resume that you led a marketing project at XYZ Company. Tell me more about that project. Give me an example of a situation where you had to handle a conflict between your employees and explain how you handled it. What were your three most significant accomplishments in your last job? What specific skills did you gain from your last job? Describe your last employer’s management style. What is the most important thing you learned at your last job? What was a difficult situation that occurred and how did you handle it? An experience interview can be a little nerve-wracking, but you’ll feel more confident if you prepare ahead of time. Before going to the interview, look at the job listing to see what specific skills and attitudes the job requires. Review the questions above and think about answers for each question. Reflect back on your past work experience to recall situations in which you have demonstrated these skills and attributes. Consider each situation in detail; you will need to be prepared to discuss these situations thoroughly and answer any follow-up questions. In particular, reflect on the specific role you played in each situation, and the actions you took to achieve success. You should also reflect on your greatest achievements and greatest struggles at your last job; companies typically ask you to describe your greatest successes and failures. Reflect on the specific actions you took to achieve each success, and what you could have done to improve in your unsuccessful projects. If you come to the interview with a number of experiences fresh in your mind, it will be much easier to answer each question calmly and concisely during the interview. Be Clear and Concise: It is easy for your answers to wander off topic when answering an experience interview question, particularly if you do not have a specific situation or problem in mind. Before answering the question, take just a moment to think of a specific example of a past situation that answers the question given. Provide a clear and concise description of the situation, explain how you handled the situation, and describe the results. By focusing on one specific example, your answer will be succinct, and you’ll stay on ​topic. There’s no need to ramble on or start talking about a different example or non-job related personal experience. Do Not Place Blame on Other People: If you are describing a particular problem or difficult situation (for example, an unsuccessful group project of which you were a member), it may feel natural to attack or place blame on another person. However, these questions are about you, not about anyone else, and blaming others may bring up concerns in the interviewer’s mind. Focus on what you did to manage the situation, and how you could have improved the situation; do not dwell on other peoples’ issues or failures.